This easy lemon tart is delicious served on its own or with roasted pears. Roll the pastry out on a lightly floured work surface to a 3mm/⅛in thickness. Use the pastry to line a 25cm/10in pastry case. Cover with a damp cloth while you make the filling. In a large bowl, mix the ricotta, mascarpone and candied peel with 100g/3½oz of the sugar and five of the egg yolks until smooth and well combined. Whisk the egg whites in another large, clean bowl until fluffy. Whisk in the remaining sugar and continue whisking until stiff peaks form when the whisk is removed. 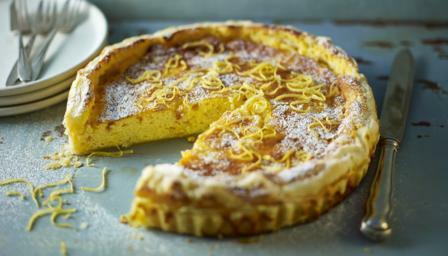 Using a large metal spoon, fold the whites into the ricotta mixture, then pour into the pastry-lined tart tin. Beat the reserved egg yolk in a bowl. Fold in the overhanging pastry and brush with the egg yolk. Bake in the oven for 30 minutes, until the pastry is cooked through and the filling has a slight wobble in the centre. Set aside to cool for two hours, then sprinkle with lemon zest.